Bloody clashes erupted in southern Kyrgyzstan Friday as the interim government moved to regain control of key regional infrastructure seized by supporters of ousted president Kurmanbek Bakiyev. Shots rang out in the cities of Osh and Jalalabad, where hundreds of Bakiyev supporters battled factions loyal to the government with sticks and stones, medical officials and reports said. At least 20 people were hospitalised in Jalalabad, some with gunshot wounds and others injured by stones or other objects, the regional hospital's chief doctor Abdy Shamshiyev told reporters. The government regained control of an administration building in Osh but the Bakiyev supporters still appeared to control the equivalent building in Jalalabad, the Aki-Press news website reported. 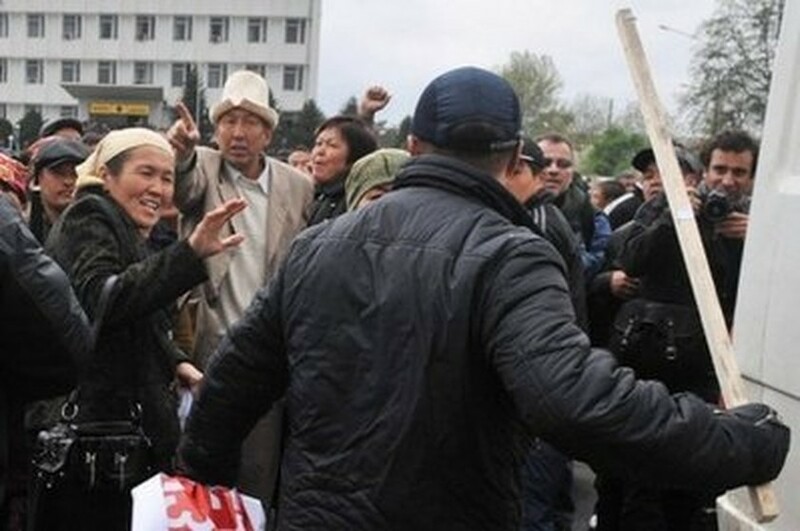 A file picture shows a Kyrgyz opposition supporter (R) facing supporters of outsed president Kurmanbek Bakiyev in Osh during clashes last month. The governor of the Osh region had reentered the building with hundreds of supporters, the reports added. The interim government meanwhile insisted it had the entire south under control. Protesters loyal to Bakiyev -- including large numbers of women -- on Thursday peacefully seized regional administration buildings in Osh, Jalalabad and the town of Batken. They also occupied the airports in Osh and Jalalabad. The interim government, which took power after Bakiyev was ousted in an uprising last month, has so far avoided using security forces against protesters in a bid not to inflame tensions. Omurbek Tekebayev, a leading member of the interim government, accused Bakiyev of being behind the unrest and said its organisers "wanted to ignite an inter-ethnic conflict in the country. "But they have not received the support of society," he added. Another top interim government official, Azimbek Beknazarov, said there was information that Bakiyev supporters were planning mass protests against the authorities on May 17. "Popular militia groups are forming throughout the country with the aim of thwarting a destabilisation of the country," he added. He also claimed that the "south of the country is completely under the control of the authorities. "Popular militia groups are patrolling the south and the government has given the order to arrest the organisers of the riots." Bakiyev was ousted last month in protests that left at least 86 people dead and brought to power the interim government which has struggled to impose its authority on the country. The latest events have raised fresh fears about the stability and unity of the Central Asian country after the toppling of Bakiyev, who drew the bulk of his support from the south of Kyrgyzstan. The ousted leader has since taken refuge in Belarus, which has so far not responded to calls from the interim government for his extradition. Russian President Dmitry Medvedev warned last month Kyrgyzstan risked civil war but the situation calmed with the departure of Bakiyev. Bakiyev's support committee in Kyrgyzstan said the day earlier that 25,000 supporters of the ousted president were making their way to Bishkek to "settle scores with the interim government". There was no immediate sign of this in the capital but his Bishkek-based support committee said that a demonstration of 10,000 people were expected later in the day. Bakiyev himself came to power in a popular uprising -- the so-called Tulip Revolution of 2005 which ousted the previous president Askar Akayev -- but became increasingly unpopular amid allegations of corruption and mismanagement.